These days I generally write on my Facebook writer page, so musings have been finding their home over there instead of here. In recent weeks I’ve written about moving; about technology and rootedness; about new beginnings; about the human enjoyment of dressing in costume. In February I wrote about when faith feels far-fetched, entitlement that surfaced in a trip to Budapest, and the demise of our ever-faithful, old car the Beast (sniff, sniff). It’s an ever-changing world for a writer, and different “homes” for words seem to make sense at different times. Also when time is short and reflections are brief, the informality of a Facebook page fits better than a full blog post. My ducks feel like the need to be in a good row for a post here, whereas a few cohesive thoughts seem workable for the Facebook page. This week I wrote a post about protecting moments of connection with our kids, fragile and infrequent as they may often be. It was in poem form, which felt substantial enough for an actual post on the blog (! ), so I thought I’d share it here too. is a jewel to be seized. on the table, nearly ready. at least one part my pride. for today anyway, the door. we moved to table and paints. 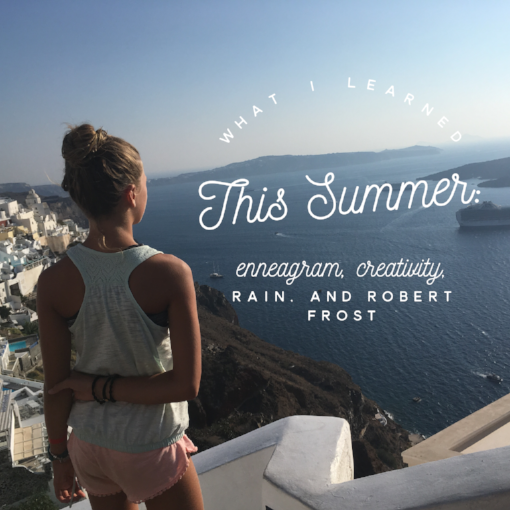 My kids have 13 weeks of summer vacation, which is… a lot of summer. We spent the first 9 weeks of summer in America with family and the last 4 weeks back in Crete. It was a full, full time - house-juggling between Massachusetts, Connecticut, and Maine; sleep-away camp for the big two; ear surgery for me; “maintenance” academics for four on the daily; big flights and jet lag on both ends. If you’re a mom, I bet you had your own version of crazy. I did a little mini-blogging on my Facebook writer’s page, snatches of reflection in stolen moments. I thought I’d share thumbnails of those posts here by way of summary- each is a couple of sentences taken from a slightly longer piece of writing. If you click on the title of any of the eight, it will open up a page that shares the rests of the words. 1. Elizabeth Gilbert on creativity is worth the read. "If you're alive, you're a creative person," Gilbert says in Big Magic - and yet we don't realize. We forget or, if we remember, we don't even care. Creativity can feel extraneous, even irrelevant. Earlier this year, a few women and I started meeting one morning a week to read the Bible, talk, and pray. The magic started, no surprise (with Him at the helm), after only a week or two of our meeting together... and it hasn't stopped yet. The words leap off the page. The hearts tie themselves together as we talk. The burdens lift as we share them. Our gatherings became a bulwark in my heart right from the start, and a highlight in my week. And so it remains today. Last week we were in John 13, covering the events just before Jesus' death, and we talked about Jesus' response to Peter when Peter asked where he was going. Jesus, in classic Jesus fashion, answered by saying, "Where I am going, you cannot follow me, but you will follow me later." Leaving Peter to of course ask a) where Jesus meant, and b) why Peter couldn't come. "What's with all the mysterious language; couldn't Jesus just be clearer?" we said. "For example he could have said, 'Later this week I'm going to be killed. I'll be dead for several days, then resurrect and remain permanently alive.' Wouldn't that have been so much simpler for everyone?" It feels like it should be easier to serve other people. I sometimes feel that way (there, I said it). Do you ever feel that way? At the front end it seems like the hard work's getting to the place where your heart is generous and you want to take time and energy to pass kindness along to others. Turning off the TV and getting up off the couch. Deciding to give up a free Saturday, to forgo your own interests. To do something you don't have to do. So OK, let's say you get to that point. You cross the hurdle: you're in. Great, now things should should be all downhill from here. After all, you have Found Your Generous Heart. You and the world are now poised to start collaborating on this serving thing - to roll out this kindness you've decided to prioritise. But then. Shock to the system - you discover that actually, that first step *wasn't* the hard part. Because now you have to plan and organise and spend money. You have to encounter obstacles. But this is illogical - why should there be obstacles when you are Trying to Serve Other People? After all (and think I mentioned this already), you don't have to do this. So you want adventure, daring, courage? Here's the secret. The day before we left, I felt nervous. I hadn't been feeling 100%, and I was a little worried I was going to spend the week being unwell. I'd never driven on the left side of the road before - much less on highways and tiny lanes... and certainly never in a rental car. And while the trip was simpler than my typical because I was only taking 1 kid (instead of 4), it had its own complications. I'd planned three stints over seven day: two hotels, a rental car, a train. Plenty of room for something to go wrong. But anyway, I thought. England, here we come. And we did - we came. Once we were underway and I was settled at the airport gate I found that it was okay. We were okay. The trip plans were okay. It would unfold as we went, and we could handle it. I'd counted on that - the foreknowledge that once you get going, the plans stand up and take themselves forward. That embarking is the thing, the hurdle to cross. This is the secret. We lived overseas when I was a kid and came back to the States only occasionally. We'd vacation and visit with family, and the specialest part of it was the tree at my grandparents' house in Philadelphia. To the naked eye it was plain and ordinary tree, just standing there in corner of their suburban front yard. But it was a *magic* tree. The fairies knew when we came to stay at Nana and Grampy's house, you see, and when we visited they would hang tiny wrapped presents from the lowest boughs with pieces of thread. So while it looked like a standard tree, it wasn't at all. It was the fairy tree. I don't remember what the small packages held, not a single item. What I remember is how diligently and reliably that tree offered us sweet gifts from the fairies, every time we visited. I remember the love I had for the tree and the delight we felt that the fairies had been readying things for our visit. I bought them at age 18, preparing to lead campers on hikes through the New England woods as a counselor. I broke them in on trails overlaid with pine needles and studded with rocks, belting out camp songs and encouraging my fellow-hikers toward the pepperoni, cheese, and crackers coming at the next break. I used them in the Rocky Mountains at age 20 when my sister and I worked on staff at a guest ranch and then again at Yosemite National Park at 21, padding through trails with my best friend on our cross country trek in her Acura, “Sparky." Four years and two moves back, I met regularly with two mom friends who also write. A couple times a month we'd gather in the evening over tea and talk writing: goals, how-to, accountability. One was writing as a fairly steady job, one contributed regularly to a couple magazines and blogged, one worked (non-writing) part-time and blogged some. The last being me. In Crete where I live, parking is... unique. Oh, cars are parked in (what I'd call) normal ways and spaces - in garages, paid parking lots, parallel parked along curbs. But they're also parked more creatively. On sidewalks. Double-parked with hazards on. Set haphazardly in dirt parking lots, where drivers snake in slowly so as not to hit others and walk away praying there'll still be an exit route open when they return. Kind of a free-for-all. So it's always an adventure when you drive downtown. A friend of mine runs a ministry in town with her husband, a combination coffee shop/laundromat/clothing outlet located on a bustling corner. And let me tell you, this girl - a dynamo if you ever met one -knows how to optimise city parking. One time a fellow volunteer was circling the block in search of a spot, and my friend showed me a trick: create a space by rolling the large mobile dumpsters set along roadsides to another spot along the road. They're set between parked cars and take up half a potential parking spot; two together can take up a whole one. Yeah, you have to leave your car awkwardly idling in the road with - you guessed it - hazards on while you finagle large rolling carts full of trash around a bit, and your fellow motorists might not be thrilled. But it gets the job done. There are two kinds of "mean" when it comes to being a mom. There's the good kind, or at least what I'd call the good kind. I'm a "mean" mom to my kids (in their eyes, anyway!) when I don't let them play video games on weekdays. Or, say, when I make them pack healthy snacks for school all but once a week. When I make them go outside to play when they'd strongly prefer to be inside. When I discipline them for misbehaviour, even when they're convinced they don't deserve it. You know the stuff I'm talking about. Fine. That kind of "mean mom" I'm willing to be - even the kind I feel I should be if I'm going to fulfill my end of this parenting gig with diligence. Then there's the other kind. The kind when I'm simply, in fact, mean. Actually mean, not just theoretically. No bigger picture, no silver lining. Wednesday night's AWANA night. The kids have been in the program for three years, and you could say the Wednesday AWANA drill's pretty well established. One Wednesday night a month or two ago I was pulling out of the church parking lot after dropping my kids at AWANA. The colors of dusk were coming up in the spring sky. I saw two minivans, carbon copies of my own, moving through the lot. I instinctively placed the vans - the moms who drove them, the kids who were in them. And just as instinctively, I knew they knew me too; there was mutual regard between us. And I can't even remember if we waved or not, got close enough to wave, at that 5:30 pm dropoff passing, but an unbidden feeling of warming washed over me. I felt among friends. I felt, of a sudden, profoundly thankful for the gift of this town, and of having place in it. For community: knowing and being known. I found myself running a reflexive scan, an internal compare-and-contrast, with our earliest AWANA evenings as Virginians years prior - navigating the routine and building and parking lot as rookies. I thought of being new, and the wading and waiting through days and months till eventually we'd won belonging. Till we'd earned the gift of being known and expected - as simple being able to identify a person by the car she drives and having her recognize yours. Gift- to belong, to have place. Too many - the orphan, the widow, the alien, the prisoner, any of "the least of these" - live their days without such luxury. Knowing and being known are, I think, among the best gifts the Father gives... And among the easiest to overlook. I experienced them as I did, I think, because I knew our time in Virginia was soon coming to a close. Knowing it's soon to end made the experience sweeter. Not long ago I was introduced to the podcast "On Being" by Krista Tippett. I heard Tippett interview Quaker folksinger Carrie Newcomer, and Newcomer talks about the benefits of grasping the finiteness of time. "When you know that time is limited," she says, "it makes a thing a little more poignant, more powerful." As she spoke the words, my van-in-parking-lot scene materialized in my mind... And I knew that moment, at once mundane and sublime, was encapsulated in her thought. As part of the interview podcast, Newcomer played her song "Every Little Bit of It," and this phrase in the lyrics stood out to me: "the curious promise of limited time." When you move frequently, there are challenges and losses, yes, but there are blessings too... One blessing is the gifts that come through this curious promise. Limited time prompts reflection, presses you deeper to see what's been gained in that chapter, encourages you to appreciate the positives that routine might otherwise obscure. You can hold and savour the beauty of something as simple as identifying a person by the car she drives. And even while we soon we will be a new place where we won't recognize any cars (or anybody) for a good while, I'll hold the community's loveliness in my heart - relishing the gift and trusting its provision for the new chapter too. And trusting in whatever other gifts the curious promise of limited time, and the God who gives them, may have for us in the new place. Love to have you as a regular reader! To receive post notifications directly to your inbox (and for your free copy of my "5 Books to Help you Live Your Adventure,") sign up here. No spam. We got him when he was eight years old and we, temporarily, were a family of seven... instead of our standard six. It was a sunny July weekend in Westport, MA, and we'd driven seemingly a zillion hours from Virginia to spend a couple short days with our families in New England. So they could meet our host son, W., who was with us for five weeks from Lativa through an orphan-hosting program. And so that we could pick up Jack. Hosting W. was our first experience in orphan care, and within days we loved him dearly. At the time we didn't know if our family future might contain him, permanently. Loving Jack came just as easily. He's a calm creature - dignified and intentional, but with a fun streak. A spry gentleman with his regal gray whiskers, and yet he enjoys running a couple quick laps around the back yard as much as any dog. His relaxed disposition allow his gentleness and loyalty to fully come through. His former owners, dear friends of my parents whose move precluded their keeping him, told us straight up his two (and only) flaws. First: he's picky with his food - won't eat scraps off the floor, like most dogs do. And second: he sleeps on couches when given the chance. They confessed these foibles almost apologetically, as if giving away secrets about a dog as wonderful as Jack was a betrayal. The voice over the phone, describing him and coordinating logistics of our adoption of him, was nearly full with tears. So our van, normally full at vacation time with our usual six and travel gear, held seven plus a dog for the 600 miles home. It was a great drive, actually. The kids were so thrilled to have a dog again, four months after we'd laid Angus to rest in the field behind our Virginia farmhouse, and so in love with Jack in particular that enthusiasm trumped bickering. And W. and Jack were absolute comrades in arms from the start. They adored each other. Once we arrived home and got Jack settled in, W. would clip his leash on him and take him tromping around outside. He had a special way, "awww, Jacky Jacky" that he'd use when he talked to him. You couldn't be together with them and not have your heart warmed. We said our sad goodbyes to W., which turned out to be the final ones, a few weeks later. By then we were all used to Jack and his place in our home. He's so easy to have around. Loud noises terrify him; he trembles and tries to sneak away during thunderstorms... Even hours before a thunderstorm he'll start his trembling, like some kind of canine barometer. We know to get him situated in the mudroom before we leave the house, for indeed, on any occasion we forget we find a warm spot on the blue living room couches, even sometimes a little drool puddle in the corner... And then we find Jack slinking guiltily, confessing his transgression through his tail-down posture. A few times he's wandered quietly off to take a turn about the neighborhood, creating panic-fueled confusion as one adult leaps into the car to drive around calling him while the other stays anxiously back with the kids. Once it was nighttime during a thunderstorm, terrifyingly - he seemed to think he might escape the nose through flight. He was never too hard to find, and he'd hop into the van with the same guilty, apologetic, "but you love me anyway" demeanor. When we announced to our children, on a January morning, that we'd be moving to Crete this summer, the one thing that really got them was that Jack couldn't come with us. Our six-year-old especially welled up; in her mind, home is home with Jack in it. I can't say I blame her. But we knew we had to let him go before we left, and we laid out the reasons why. Some gifts come for a season, and we must be willing to let them go - heartbreaking though it may be. God would find Jack another perfect home, we assured her, just as we were the perfect home for Jack when we adopted him two years ago. We could trust him with that. And she accepted it. And God has faithfully found that home; within days Jack will go into it. And our chapter with him will close. The first Bible verse I ever taught as a mom was this one, out of Proverbs (my paraphrase): "Good people care for their animals, but mean people are never kind." Truly, it was a pleasure to care for Jack during his years with us. That he returned that care toward us, so loyally and gently, is a gift for which we'll always be thankful. Rain was forecast the day our "goodbye Aricos" gathering was scheduled - a scenario unheard of in sunny Ventura, land of no-raindates-needed. The two beloved neighbors hosting the shindig on the tight, well-kempt cul-de-sac we called home decided to postpone a day. The adjustment conflicted with a few schedules, but the nearest and dearest came along to the little cookout, sweet hand-made sign our backdrop, where we ate and chatted about the farm we'd be moving to in King George, Virginia - the rural town we'd be adopting in middle January, the 100-year old house we'd be renovating. As the babies began to fuss and the paper plates were being gathered up, several pulled up to offer quick hugs and goodbyes. T was one. "I just stole away for a minute," she said, toddler on her hip, a house-full of relatives back home with her husband and other kids. "But I came because I wanted to tell you this: you changed my life." If surprise were a ball flying at me through the air, I'd have dropped it. I almost couldn't register the words that quietly filled the air between us. I'd changed her life? What? For such words are reserved for hospital bedsides or weepy funeral parlors. Or they're penned out, perhaps, in cards mailed out to mentor, referring to events and era safely past. But stated directly in bustling setting like this? "I'll miss you" or "I'll never forget you" or even "I love you" would make sense, but such words as these I could never have have expected. Odd too because of who T is. We'd spent time together in my final California year - met together a handful of times to pray, walked and chatted once or twice along the beach. And I admired her enormously.... A woman of uncharted depth and unusual grace. A woman with an uncommon and compelling spiritual life, in whom the Holy Spirit shines out starkly, close enough to the surface you can almost grasp him. It was this spiritual shining, in fact, that had first intrigued and most compelled me about her. A woman more like the Sarah Smith of Golders Green that C. S. Lewis describes in his imagined journey through heaven than most anyone I've met. Not an ordinary kind of woman. T had moved and enriched me, to be sure, in the months we'd known each other, but nothing about our interactions made me feel that my presence in her life might be in any way life-changing. So they baffled me, her spoken "You changed my life." All the more in that she'd make a point of coming to deliver the words personally - with brevity and no fanfare. And yet she did. They were like a benediction spoken over me, so that in that moment I was seen, known, uniquely affirmed by another. A person could live her whole life and not receive a gift like this. I carry it with me always. And this spring It's moving time again; another chapter closes for us. It dawns on me quietly one day that this scene is a repeatable one; this gift is one for sharing, not hoarding. This time I get to be the bestower. As I drive to meet R for coffee I think on this. Among the dear friends Virginia has brought me, it's this one who has awakened in me the a latent pursuit of wonder and sense of dwelling with transcendence. It's her love for image and the way she sits with beautiful words that have spoken to my deepest heart. I realize, when I browse the poetry books she's leant me (she reads it regularly herself and aloud, daily, to her kids) that it's been nearly two decade since I dwelt with poems this way - dwelt with slow, beautiful, gradually-dawning truth. But poems begin again come to sit with me like old friends... because of R. And a piece of myself is returned to me, like a reunion with a part of my soul that the years had invisibly packed up. How do you even get your arms around a gift like this? "You changed my life," I tell her, our backs pressed against the coffee shop door as raindrops fall in the dark sky. "You returned a piece of myself to me I didn't know I'd lost, just by your quiet living out of your bright, wonder-filled, poem-filled life." I see the surprise and the quiet wonder spread out across her face. "That's one of the nicest things anyone's ever said to me," she said. And I knew just what she meant. So it was that thoughts about sports, God, and their interplay bounced around in my head as I ran the Marine Corps Half Marathon last weekend. It was the third half marathon I'd run; my first was in 2004 (before I had my gaggle of kids) and my second was in 2014, shortly after I'd moved to Virginia. I wanted to run the thing faster than I had in 2014. I wanted to for a couple of reasons.... First, I'm in better physical condition than I was two years ago since I've added strength training (which I generally loathe and had previously avoided at all costs) into my regimen. And second, my overall person - my emotional health, my sense of self, my "joie de vivre" - is in better shape now than it was two years ago. The metaphor-lover in me wanted this to be reflected in my race time. My "Virginia chapter" has been one of much personal growth, and I wanted to be able to feel the reality of that when I ran. I wanted to close the chapter on a high note that encompassed the intangible and tangible, both. Isn't it funny that we have a drive for the inside and the outside to be analogous this way? But we do, we all do. It comes with our being whole, multi-orbed people - mind, body, soul, and spirit all working together. It's why athletics have the power to so deeply spur people to inspiration, to teeth-gritting determination, to feats they didn't think they could accomplish... even to transcendence among those simply supporting the athletes (let alone the athletes themselves). And the metaphors kept rolling for me as I ran on Sunday, a morning that dawned cloudless after days of continuous rain. The pounding feet of my compatriots, united in purpose, felt like the thundering parade of saints, pressing forward together. The upfront investments - the hours spent training and the bucks shelled out to cover those raced miles - were the sacrifice that comes with the life of faith, the cost-counting God asks of his followers. The fans cheering on the sidelines were the great cloud of witnesses, encouraging us forward. (No matter that that faces were those of strangers, since heaven holds no strangers- all are smilers, wavers, supporters in the personal journey and cause of each.) Even the volunteers were other-worldly: when else in life are you surrounded by hordes of people who go out of their way to slake your thirst when you need it, then happily pick up your trash? We have a God who cares not just about our souls but about our bodies, who made us with bodies on purpose. For this I'm thankful. We get opportunities for whole-person learning and whole-person growth through the movement of our bodies, and this, I think, is a gift among gifts. Some things can be gained through blood, sweat, and tears that can't be gained through other avenues. And the race? I shaved four minutes off my 2014 time and made my goal of 2:00. And I rejoiced.